Hampton Creek, like most companies nowadays, employs data for marketing. More interestingly, the packaged-foods startup yesterday explained how it crunches the numbers to create products that are more profitable, environmentally friendly and healthier to eat, tapping into data from more than 400,000 species of plants. 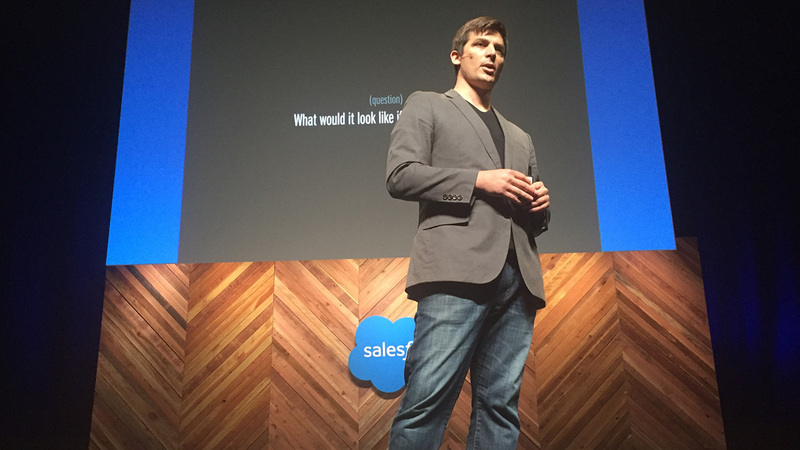 "We can find grains out there that we haven't utilized," said Josh Tetrick, Hampton Creek CEO, speaking at Salesforce's Dreamforce conference in San Francisco on Tuesday. "We screen through them and try to find the best of them to enable us to start over and make everything from a pancake to a muffin to mayo to scrambled eggs a little bit better." For instance, Tetrick said, two of Hampton Creek's products—Just Mayo and Just Cookies—have saved 1.5 trillion gallons of water and avoided more than 219 million grams of saturated fat. Tetrick said that out of the 400,000-plus grains and plants discovered worldwide, food producers for a long time have fixated on just two: corn and soy. "We forgot that if we step back, we can see a lot more," he said. So, Hampton Creek was founded in 2011 and began analyzing little-known grains to find nutrition and cost-effective harvesting—essentially looking for plants that can be tasty, yet require little water to grow, such as the Canadian yellow pea. "The problem is, you've got all this crappy food, and it's cheap, because it's mostly driven by soy and corn," Tetrick said, noting that healthier food tends to be expensive. "Then you step back and say, 'How do you fix that?' Then you realize that you've got a huge data space out there that people haven't touched." Hampton Creek's research has generated three products: Just Mayo and Just Cookies as well as Just Cookie Dough. These items have found their way onto the shelves of stores such as Whole Foods and Safeway, but Tetrick said he is proudest of the placement in budget-minded stores like Dollar Tree. When it comes to taste, TV's culinary adventurer, Andrew Zimmern, is a fan (see video below). But Hampton Creek's methods have recently come under fire after several former employees told Business Insider that Tetrick and his team were using shoddy science. One former employee, per BI, called it a "food company masquerading as a tech company." At the same time, with $120 million in investor cash, Hampton Creek will still be one to watch. Tetrick said his company's foods require 55 times less carbon to make and last five times as long. And perhaps most importantly, he claimed, the foods need 57 times less water than their traditionally made counterparts. Since its home state has mounting water issues, that should be music to Californians' ears.